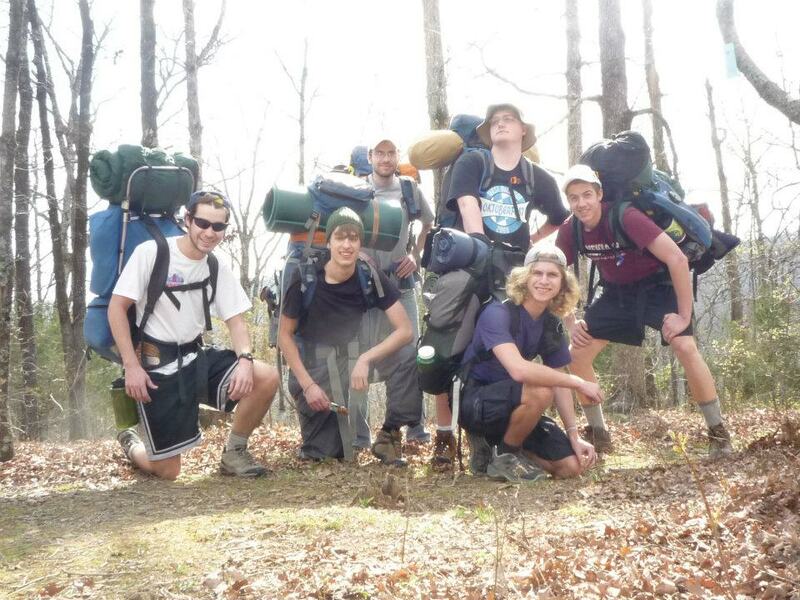 In March 2012, spring break of my junior year of college, a few friends and I decided to head to the Ozarks of northern Arkansas to do a little backpacking. 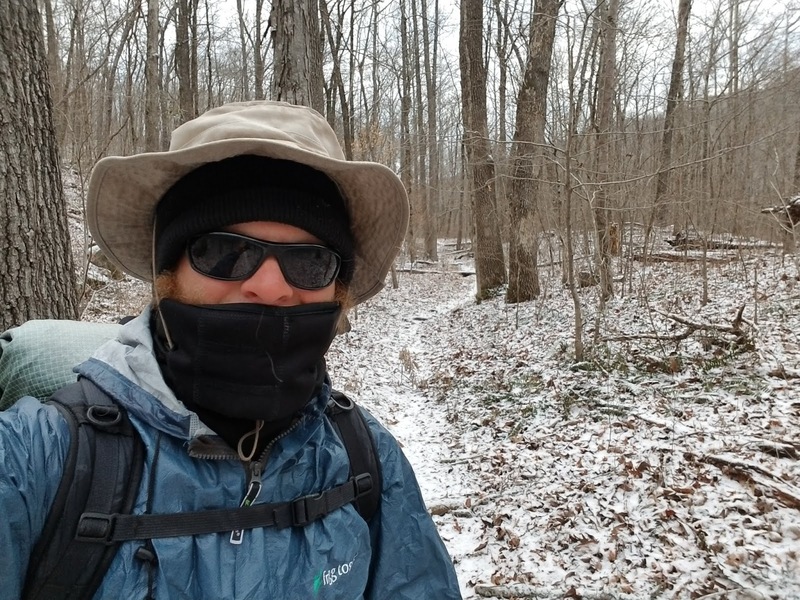 We had taken our first backpacking trip a couple years before, and that trip had turned out to be a miserable failure - hypothermia, lost shoes, and deep snow, just to name a few travails. We had quit our planned route and had gone home early. This was our second trip. This trip was going to be different. This trip was going to be a success. We were all still relatively green, but far better prepared than last time. We were enjoying it. We took our time, cooked breakfast and delicious dinners each day, and enjoyed wearing our short sleeves - a welcome reprieve from the eternal Michigan winter. Within the first two days, we had covered about 25 miles - almost half our planned distance. And then it started to rain. And it kept raining. We were quickly soaked, miserable and, you guessed it, hypothermic. Most importantly, the creeks we had to cross quickly swelled and became perilous, raging torrents. The choice was clear. We bailed. Again. That failure stung a little bit. I had gone backpacking twice, on both occasions defeated by a combination of bad weather and my own inexperience. Was I skilled enough, strong enough, tough enough to be a backpacker? Were my plans to hike the Appalachian Trail doomed to failure? Over the years, I've revisited many of the locations of those early (2010-2012) backpacking trips. In 2010 I went to the Smokies as a rookie (the infamous lost-shoes trip), and returned to the area in 2013 as part of my Appalachian Trail hike. In the summer of 2012, I bagged Kings Peak and hit up the Tetons; in 2014, I returned, older and wiser, and did those areas justice. But I'd never been back to the Ozarks. I'd never been back since rain and inexperience washed out my plans. So, with a couple of free weeks before starting this year's long hike, I decided to finally go back and do the Ozarks right. This time, I would hike the length of the Ozark Highlands Trail (165 miles). It was a fitting final stop to my road trip. The Challenges: It quickly became apparent, though, that I'd again have to contend with significant challenges on the OHT. 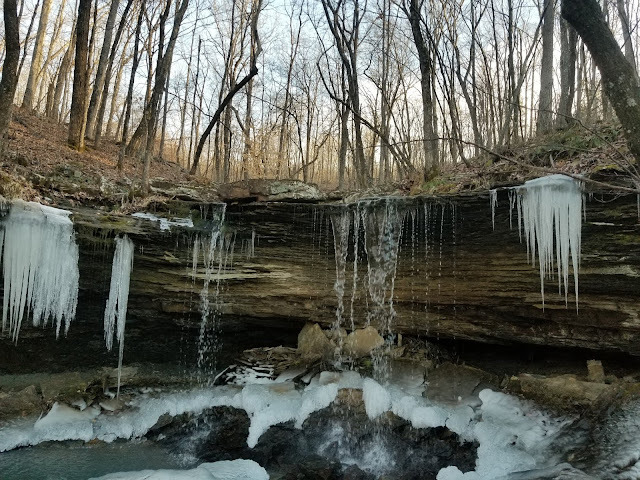 A highly unseasonable cold snap hit on the day I started, and temperatures didn't rise above freezing until the fourth day. And once things warmed up, it started raining. In nine days, I think I had roughly six hours of pleasant weather. Everything else was either bitterly cold or rainy. The weather challenges served to magnify the difficulties posed by the terrain. While the entire OHT is fairly well-marked (about on par with the AT), I found the maintenance to be spotty at best. I found a lot of semi-overgrown, thorny trail and uncleared blowdowns. Perhaps it's better in a month or two, when the volunteers who maintain the trail have a chance to get out and do more work. But the most frustrating part was the rocks. 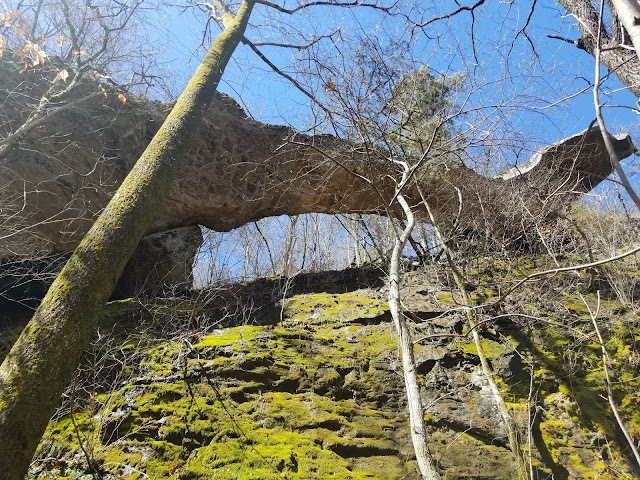 The Ozarks are infamously rocky, and rocky trails covered with several inches of leaf detritus made every step an adventure - I couldn't see the rocks I was about to step on, making it impossible to plant my feet squarely. Progress was slow and frustrating at times. 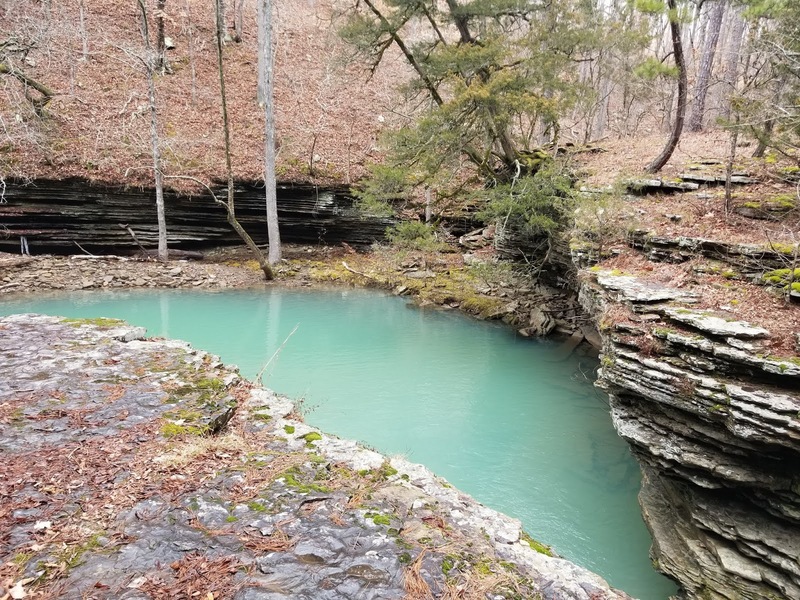 The Water: More than any other trail I've ever hiked, the Ozark Highlands Trail is defined by water. The Ozarks are more of a highlands-type area rather than a true "mountain" range in the classic sense of the word. And as such, they don't have one defined ridgeline or crest. In practical terms, that means that there's no such thing as "staying high". The trail repeatedly climbs up out of a creek's drainage, traverses some high terrain, and then drops back down to cross the next creek. These creeks are quite lovely for the most part, with bright blue or green water. I managed to gingerly hop across most creeks from stone to stone without getting my feet wet, but there were perhaps a half dozen unavoidable wet crossings. On one occasion, I had to swim. In addition to the creeks, I passed dozens of waterfalls on the OHT. 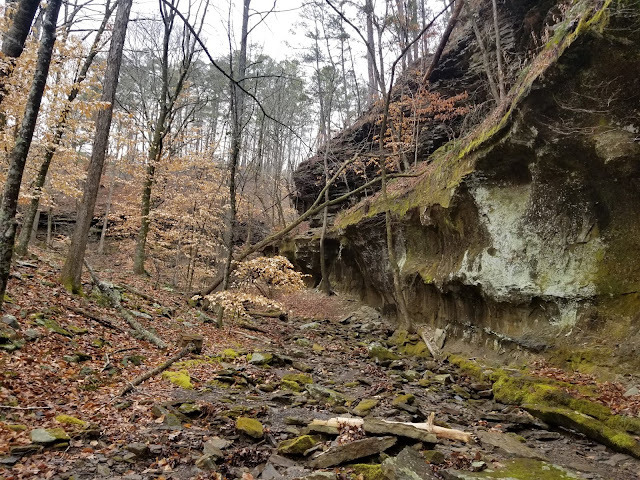 The layered limestone geology of the area is conducive to the formation of waterfalls, especially given how wet the Ozarks are. 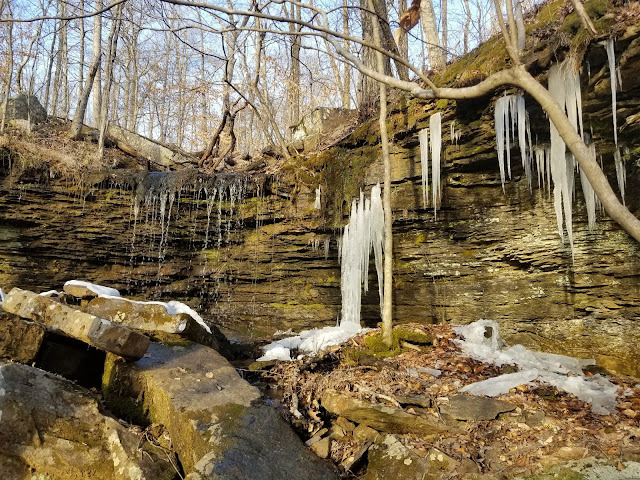 Many of the waterfalls featured interesting ice formations, the result of all that cold weather. Redemption: When I hiked the Ozark Highlands Trail the first time, it was difficult. We experienced hardship. And we were not entirely prepared to deal with that level of hardship. The second time around, I expected that I would not face nearly as many hardships, a function of my experience and comfort in the outdoors. I was wrong. The Ozarks were once again wet, cold, rocky, and often unpleasant. Experience didn't eliminate the challenges. But it did equip me to better deal with those challenges. Last time, I quit on Day 3. This time, I made it. And, despite the challenges, I enjoyed it. Mission accomplished.